Recommended Citation: Krisanda, J and A R Peslak. 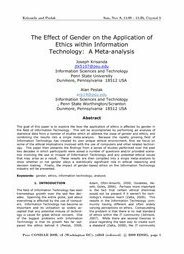 The Effect of Gender on the Application of Ethics within Information Technology: A Meta-analysis. In The Proceedings of the Conference on Information Systems Applied Research 2009, v 2 (Washington DC): §4353. ISSN: 0000-0000. The goal of this paper is to explore the how the application of ethics is affected by gender in the field of Information Technology. This will be accomplished by performing an analysis of statistical data from a number of studies which all address the issue of gender and ethics, and combining the results into a single meta-analysis. Because the rapidly growing field of Information Technology has created its own unique ethical environment, first we focus on some of the ethical implications involved with the use of computers and other related technology. This paper then presents the findings from a series of studies performed over the past two decades in which participants were asked a number of questions and/or provided scenarios involving the use or misuse of Information Technology and any potential ethical issues that may arise as a result. These results are then compiled into a single meta-analysis to show whether or not gender plays a statistically significant role in ethical reasoning and decision making. Finally, the impact of gender-based ethics on the Information Technology industry will be presented.